The size of the challenge facing a chancellor who has pledged an economy "that works for everyone" is becoming increasingly clear. And it is not just down to Brexit. After an Autumn Statement which abandoned pledges to hit a government budget surplus by 2020, new analysis claims the squeeze on living standards could be worse during this Parliament than between 2010 and 2015. The report by the Resolution Foundation says lower earnings and higher inflation could mean incomes growing less than half as fast between 2015 and 2020 compared to the years following the financial crisis and the recession that followed. It also says that the "jobs miracle" which saw unemployment fall below 5% "would not be repeated". The figures reveal the difficult position the government could find itself in by the next election after its pledge to support those who feel themselves to be "just about managing". 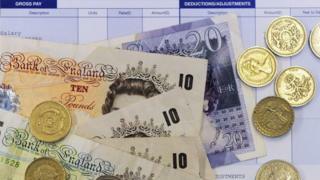 The Resolution Foundation study said the freeze on benefits and rising inflation could mean the bottom third of earners seeing their incomes fall. The findings of the study are echoed in the Treasury's own "distributional analysis" which looks at the impact of tax, welfare and public spending pledges contained in the Autumn Statement. Those charts say that the bottom 30% of earners are likely to be worse off. Only the top 10% of earners will see as significant a hit, with middle income families slightly better off by 2020. The Resolution Foundation report, to be released later this morning and seen by the BBC, says: "The weak outlook for real average earnings, which the OBR [the Office for Budget Responsibility] forecasts to be £830 lower in 2020 than previously expected, means that the decade from 2010 to 2020 is set to be the weakest one for wage growth since the 1900s. "Real weekly earnings are forecast to grow by just 1.6% over the decade, compared to 12.7% in the 2000s and over 20% in every other decade since the 1920s." Sources close to Mr Hammond have told me the chancellor is well aware of the difficult economic situation he faces and say that is why he has made increases in UK productivity his priority. If through investment in skills and infrastructure he can create the conditions to allow the economy to perform better, then the OBR's forecasts may prove too gloomy. Interestingly, the chancellor relaxed the government's spending rules not to reverse the benefits freeze or cut taxes, but to invest in infrastructure (such as new roads) and "innovation", in short research and development skills. Economic models suggest there is a direct relationship between infrastructure spending, skills investment and better economic growth and therefore wage increases. Weak productivity growth was a major problem for the UK economy well before the vote to leave the European Union. But, although the government announced increased spending yesterday, if private sector investment falls due to the uncertainty following the Brexit decision, then that could more than wipe out all of the fresh money being offered by the government.